The recent vote in the European Parliament and continuing discussions in Council make it clear that the EUETS is likely to remain weak for many years. In this context, other climate change policies in Europe will need to be strengthened if Europe is to make a smooth and successful transition to a prosperous low carbon economy. The EUETS has been running a surplus since its early years. This trend continued last year. On preliminary estimates for 2016 emissions were around 11% below the cap. 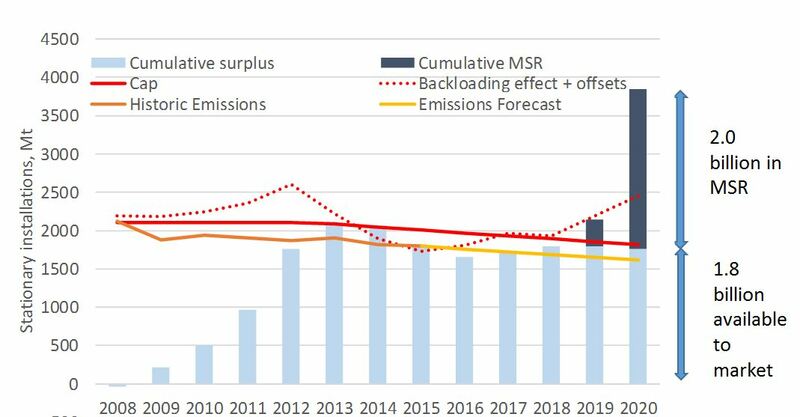 By 2020 (the end of Phase 3 of the EUETS) the cumulative surplus of allowances will have reached nearly 4 billion tonnes, the equivalent of more than two complete years of emissions. A little over half of this will be in the Market Stability Reserve (MSR), with the rest available to the market (see Chart 1). Furthermore, there does not look likely to be any scarcity of emissions in Phase 4, which runs to 2030. 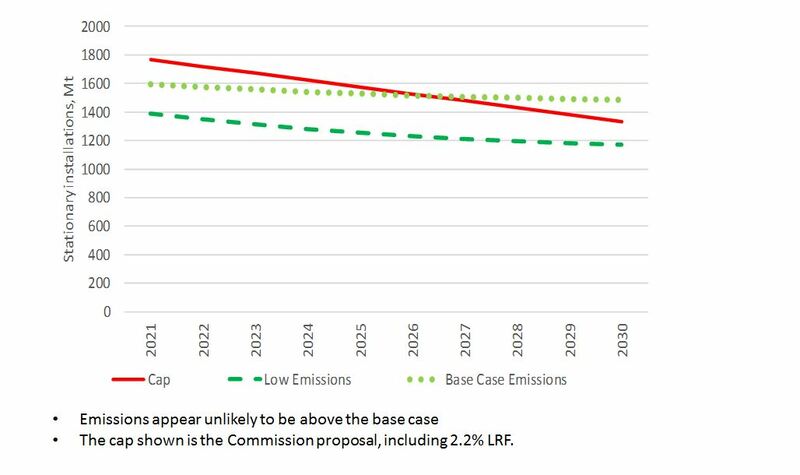 Total emissions over Phase 4 (2021-2030) look likely to be below the total cap (and perhaps greatly below) even with little abatement due to the carbon price (see Chart 2a). The reason for this is that emissions start well below the cap – indeed emissions are already below the cap for 2020. Consequently it takes a while for the cap to fall below emissions (see Chart 2b). Indeed, the cap may not fall below emissions until after 2030, especially if there are significant reductions in generation of electricity from coal, which currently accounts for 40% of all emissions under the EUETS. This type of case is illustrated by the low emissions scenario in the charts. The measures passed in the European Parliament last week include a doubling of the rate of transfer from the MSR for four years, so removing surplus allowances from the market more quickly. This is welcome, but does not have much effect. The surplus available to the market is so large that by the time it has been largely moved to the MSR the slower rate has had a chance to largely catch up (see Chart 3). In both cases a substantial surplus persists for most of the decade even under the Base emissions case. The decision to cancel 800 million allowances from the MSR is also welcome. Indeed much more cancellation will be required in future, and ideally the size of the MSR should be limited, for example to a billion tonnes. However without further reform this will only have an effect in the very long term. 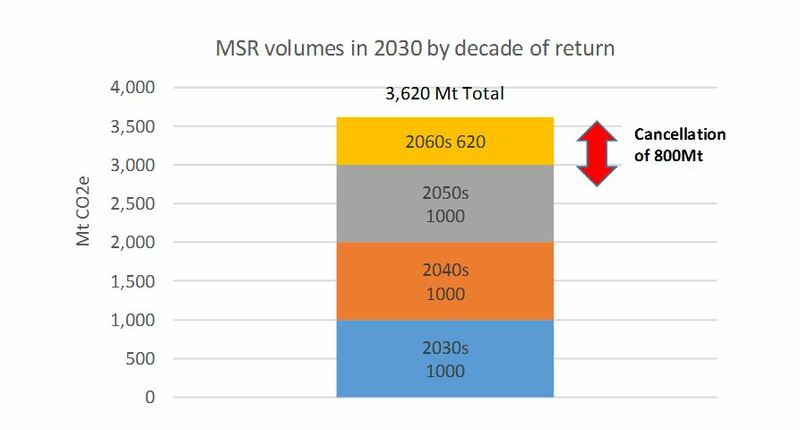 The MSR will be so large by the end of Phase 4 that allowances will take several decades to return at the maximum allowed rate of 100 million per annum (see Chart 4). The 800 million allowances due to be cancelled would anyway have returned only in the about the 2050s. They thus have almost no effect on the market over the next decade and a half. With such an oversupply of allowances the price seems likely to remain weak. How weak is impossible to say, but the price has not perceptibly moved as a result of the recent vote in the ENVI committee and the Parliament. Prices have remained at around €5/tonne, and the forward curve currently shows prices essentially flat at this level to 2020. It is also hard to see scarcity of allowances being sufficient to drive substantial abatement for several years beyond 2020, and perhaps much longer. This implies that the EUETS will fail to deliver adequate or efficient signals for either short term abatement or longer term investment in low carbon technologies. The EUETS looks likely to become mainly a backstop mechanism and an accounting and MRV framework, rather than the primary driver of action many wish it to be. This in turns requires other policies to provide most of the incentives to decarbonise if low cost abatement opportunities are to be realised now, and if the European economy is to be put on track for a prosperous low carbon future. National carbon pricing initiatives, perhaps along the lines of UK carbon price floor and similar measures proposed in France, with perhaps groups of countries adopting similar or even co-ordinated policies. Additional restrictions on coal plant, including closure in some cases. Assistance with selected low carbon technologies, including CCS, for industry, especially as low EUA prices are likely to mean that the EUETS’ Innovation Fund will not be worth very much. Emissions performance standards for certain sectors. Continuing emphasis on energy efficiency and renewables. This in turn risks further weaken the EUETS unless opportunities are taken to fix it in future. Indeed it risks a reinforcing feedback of weaker price signals from the EUETS leading to more additional actions, leading to yet weaker price signals, and so forth unless action is taken. Action to correct the EUETS and avoid this is certainly desirable, but now looks unlikely on any substantial scale for at least the next several years. There is another possibility that might emerge. One of the changes in the current package allows Member States to cancel allowances rather than auction them. It is possible that a group of larger Member States could collaborate and cancel substantial number of allowances. Such an approach would be to be most effective once the MSR has absorbed more of the current surplus. This could lead to a group of Member States doing what Parliament has been unable to do, and Council appears unlikely to do. This may not be a model of Europe wide decision making, but may be the as good a chance as any for the EUETS to succeed. Yet such action by multiple Member States at a large scale still seems distant, and may never occur. The priority must be to put in place other policies which help put the EU on track to meeting its long term decarbonisation goals, and which work towards delivering the Paris Agreement commitments. This post is in part adapted from a talk I gave at the Dutch PermRep in Brussels on 7th February, modified to take account of the subsequent vote in the Parliament. Thanks to Boris Lagadinov and others at Sandbag for providing the charts for this post. Further material can be found on the Sandbag website. 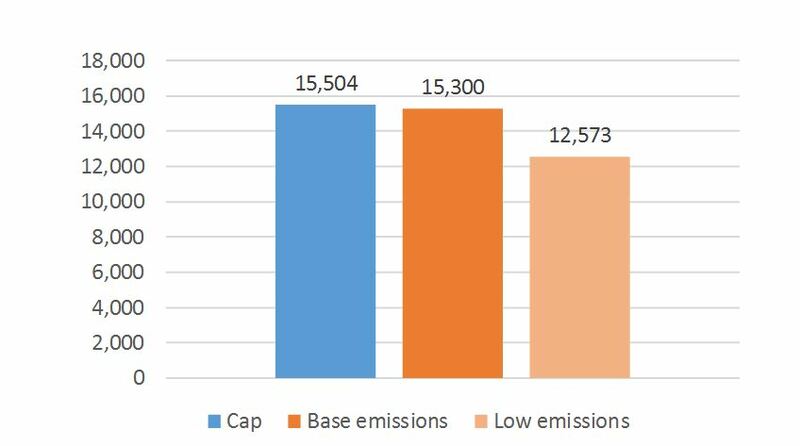 Emissions in 2016 were 1754Mt (preliminary estimate) compared with the 2020 cap of 1816Mt. This entry was posted in Climate change policy on 24/02/2017 by adamwhitmore. Carbon pricing should be used to establish wealth funds from which current and future citizens can benefit. Climate change depends on the cumulative total of emissions of greenhouse gases, so total cumulative emissions globally must be limited by the need to limit climate change. This limited total of cumulative emissions is sometimes referred to as a global carbon budget. Specifically, if global mean surface temperature rises are to be limited to two degrees centigrade, as now mandated in the Paris Agreement, total cumulative CO2 emissions from now on must be limited to around 1600 billion tonnes of CO2. From this perspective the atmosphere is a finite resource that can only be used once, rather like any exhaustible natural resource, with the important caveat that (unlike many natural resources) no more atmosphere remains to be discovered. At the moment only a very small proportion of greenhouse gas emissions is priced adequately. Most emissions remain unpriced, and the growing proportion that is priced is mostly sold at well below both the cost of damages, and well below the value of an increasingly scarce resource. A valuable scarce resource is thus being given away or sold below cost, subsidising emitters. Huge natural wealth is being squandered. And once gone it can never be replaced. So is there a better approach to managing this precious resource? It seems to me that there is. It would be much better to realise value of emissions in the form of a fund for citizens, with proceeds from carbon pricing (the sale of allowances or taxes) paid into the fund. Carbon pricing should be comprehensive, with prices at adequate levels. The finite volume of the resource implies it is best used to establish a wealth fund, where financial capital is built as natural capital is used up. The fund would belong to all citizens. Granting its value to citizens would surely encourage better management of the atmosphere, and thus the climate, and higher carbon prices than generally prevail at present. Such a fund would be analogous to a sovereign wealth fund based on oil and gas reserves, of which the Norwegian fund is the leading example. Wealth is invested in productive activity, with the income from this available to fund pensions and other expenditure. So, how much might this resource be worth in purely financial terms? Each tonne of CO2 emitted to the atmosphere should be priced at a minimum of the cost of damages from climate change – the social cost of carbon. This is currently around US$50/tonne, and rising over time. Emissions may be more valuable than this, either because of the limitations in estimates of the social cost of carbon (see here), or because the value of the emissions in terms of the economic activity they enable is greater than their cost in environmental damage. But evaluating the resource at its cost at least puts a lower bound on its value, unless the economic value of those emissions is below the cost assumed here, which seems unlikely with such a constraining budget. The profile of emissions also matters. For simplicity I’ll assume current emission levels to 2020, then a linear decrease to the end of this century. This is broadly similar to many emissions tracks that have been modelled as consistent with 2 degree warming, and (consistent with this) the cumulative total is close to the 1600 billion tonnes budget I mentioned above. It is also consistent with the Paris Agreement goals of reaching net zero emissions at some point in the second half of the century. The annual value of emissions is then estimated from multiplying the (rising) cost of emissions with the (falling) quantity of emissions. This is shown in the chart below. The effects of rising prices and falling emissions roughly balance over the next 50-60 years or so, with revenues remaining roughly similar at close to $2 trillion p.a.. Revenues then fall rapidly in the last quarter of the century as emissions fall to zero. The eventual value of the fund, excluding investment returns and dividends paid out, is the sum of these annual revenues (the area under the curve). 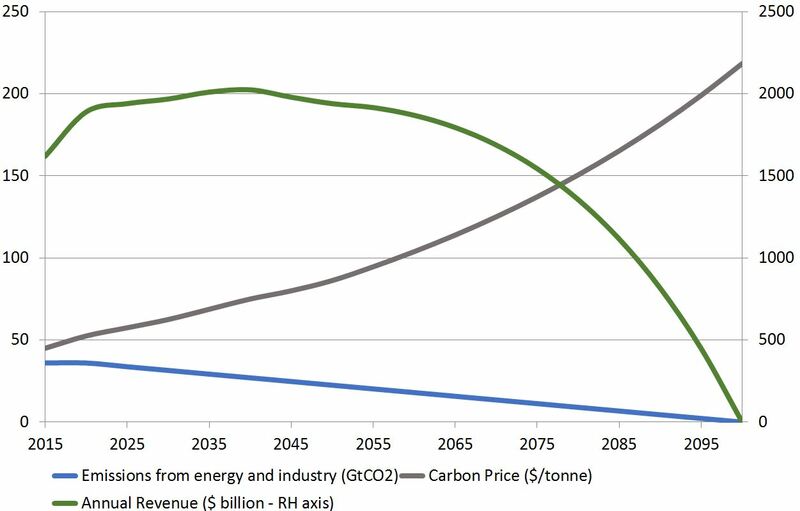 On this basis, the total value of the remaining carbon budget is a staggering $130 trillion. This is equivalent to $13,000 for each person in the world, assuming world population of 10 billion people later this century. A 3% annual dividend from this would generate about $400 p.a. for everyone. Dividends from the fund could be used in many ways. One approach with a range of advantages is distributing benefits to all in the form of a “citizen’s dividend”. There is already a feature of the Alaskan wealth fund derived from oil revenues, where distribution is in the form of a Permanent Fund Dividend to all citizens. This is widely considered to have helped build and maintain public support for the scheme. This approach is closely related to the idea of “tax and dividend” carbon pricing. I have previously argued that such approaches have merit, and indeed tax and dividend has recently been advocated by senior Republicans in the USA. However, there is an important difference between a fund and tax and dividend as often presented, in that revenues are used to establish a fund that is intended to be permanent, whereas tax and dividend proposals often assume revenues to be distributed in full. There is also a relationship between the idea of a citizen’s dividend and a universal basic income, which is much discussed at the moment and subject to a few trials. However, there is a crucial difference in that the citizen’s dividend does not seek to provide an adequate income. Rather it is simply a return on funds invested. Instead, it is likely to be one component of any universal basic income. There is a natural case for distributing dividends equally, as all have equal rights to the atmosphere. The atmosphere is a global resource, and climate change knows no borders, so it is natural to make any fund global. However establishing such an arrangement is likely to be too great a political challenge. A bottom up approach with individual nations pricing carbon and establishing their own funds is likely to be much more tractable. Such a national approach would have other advantages. For example, it would allow other environmental taxes, such as those on landfill, and indeed other sources of revenue to contribute to the fund. A series of national funds would not stop any fund being used to finance activities of international benefit – indeed such uses would be highly desirable. Establishing national funds will have many challenges. However the prize seems large enough to be worth pursuing. The current system of simply allowing emissions to be dumped into the atmosphere, often free of charge and almost always too cheaply, is a waste of a unique and irreplaceable asset. Irreplaceable natural wealth such as the atmosphere should be managed carefully, not squandered recklessly. Based on “Warming caused by cumulative carbon emissions towards the trillionth tonne”. Allen et. al. Nature vol. 458 (2009), adjusted for emissions since the publication of that paper. Many people, including me, would also wish to note the ethical dimension here. It is not appropriate to treat the atmosphere only as mere resource for people to use as they wish, and all decisions about its management must reflect ethical considerations, including responsibilities to future generations, and the duty of care to the world’s natural heritage. I am simply arguing here that treating it as valuable resource would be a major step forward from treating it as a resource to be used as though it were unlimited and emissions were inconsequential, as is often the case at present. For an excellent review of Sovereign Wealth Funds and how they could be better managed and used for the benefit of citizens see Angela Cummine, Citizens’ Wealth, Yale University Press, 2016. If the price would be lower than the SCC with this emissions track it implies that the 2 degree target is too loose and 1.5 degree or lower would be preferred. This is a rough and ready calculation, taking CO2 emissions from energy and industry only. It ignores the effect of other gases and effectively assumes other sources of CO2, mainly deforestation, are approximately net zero cumulatively over the century after taking into account the role of sinks and deforestation. This may be optimistic. Adjusting for these would lead to a higher starting point and steeper decrease in emissions, reducing somewhat the value of the fund. In this scenario emissions are low enough to be balanced by a small quantity of negative emissions by the last decade of the century. See Angela Cummine, Citizens’ Wealth, Yale University Press, 2016., p.140-2. This entry was posted in carbon pricing, carbon taxes, Climate change policy, emissions trading, Revenue on 13/02/2017 by adamwhitmore.